My story really isn’t about me; it’s about God’s transformation in my life through the FP4H program. When people see me, they automatically think I have been in shape and exercised all my life, but that is so far from the truth. The truth is that I loved to eat and was a “couch potato.” I knew every number on the fast food menus, and had such a sweet tooth that dessert was part of each meal. I was so out of shape and overweight that my arms used to flap every time I moved them. My eating and non-exercise habits led me to years of yo-yo dieting. I tried so many diets: the high-carb diet, the low-carb diet and Weight Watcher’s. All these diets worked. I would lose 20 lbs., but would then go back to my old eating habits and gain it all back again. I lost the same 20 lbs. at least four times in my life. 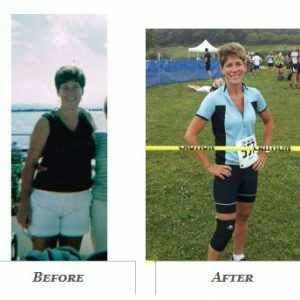 By the time I was 44, I was overweight by 30 plus pounds, spiritually dry and depressed. I knew I needed to change my life, but didn’t know in what direction to go. I was on high blood pressure medication and wasn’t able to walk up a flight of steps without being short of breath. My church was offering a FP4H class and I felt the Lord leading me to sign up. God has such a sense of humor; He gave me a love and a passion for biking. He also released me from my food obsession by helping me identify where it started. I realized after reading a book called Half the Mother Twice the Love by Mother Love that my obsession for food came from my childhood. As I identified with her stories of food with family reunions, Sunday breakfasts and holiday gatherings, I realized that was where my food obsession started. As I read the last page, I was released from my obsession. It was unbelievable. God is so amazing and the Bible study changed me so much that I started my own group a year later, which ran for a couple of years. God says He will restore what the locusts have eaten (Joel 2:25) and that is what He has done in my life. I feel better now than I did in my 20’s and am doing things that I never dreamed of doing. I can now run up a flight of steps without getting short of breath, and every time I hit the top I always praise God. I also went from a size ten to a size two. I am now preparing for an Ironman Triathlon for my 50th birthday. I went from a couch potato to getting second place last year in a Duathlon, a 56-mile bike ride climbing over six thousand feet, then a 13.1 mile run named Savageman, which is billed to be one of the toughest Ironmans in the world. God is so amazing. I just want to encourage you that it’s never too late and you’re never too old or out of shape to get started. When I started biking, I had to walk up every hill in my neighborhood and when I started to run, it was a few feet at a time. Swimming has been very challenging for me. I realized the day before my first triathlon that I wasn’t able to swim more than 100 yards, but knew God had called me to do this triathlon. I kept questioning God—not believing it would be possible—and worrying about drowning. Before I went to the triathlon the next day, I turned on the radio and the song that was playing was Stronger by Mandisa with the lyrics, If the waves are taking you under, hold on a little bit longer; this is going to make you stronger. I knew God had a plan and could make impossible things happen so I went for it. In the water I made it to the first buoy and then I panicked. I flipped on my back and finished the swim. I don’t know to this day what happened or how I got from the first buoy to the end; all I know was that I made it. I felt like the blind man in the parable of John 9:25, I was blind but now I see. God made the impossible possible and I have learned so many lessons on my journey. I was never an athlete so I started from the beginning—one step at a time. My step started with the FP4H Bible study and then God did the rest. As I put Him first, He balanced the rest of my life. His Word tells us in John 15:5 that apart from Him we can do nothing. It’s amazing to see where God has brought me and I give all the glory to Him. I pray that God will take “first place” in your life as well.